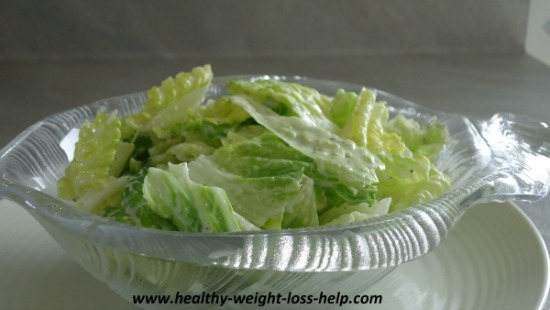 Caesar Salad Recipe - Is delicious with fewer calories using one simple trick. This Caesar salad recipe tastes decadent but has fewer calories and is made in minutes. It’s so fast yet perfect for dieting and tasty enough for entertaining. Then this low calorie salad works well. Separate the lettuce leaves, wash well. Then dry the leaves either in a salad spinner or wrap leaves in cloth or paper towels for a few minutes. Tear lettuce leaves into a large salad bowl. Now combine add all the other ingredients in a separate bowl and mix well, then add this dressing to the lettuce leaves and toss till well blended. The best part is that the dressing taste like Caesar dressing but with a fraction of the calories. It’s the combination of the freshly squeezed lemon and garlic that makes it so tasty, zingy and mouth watering. 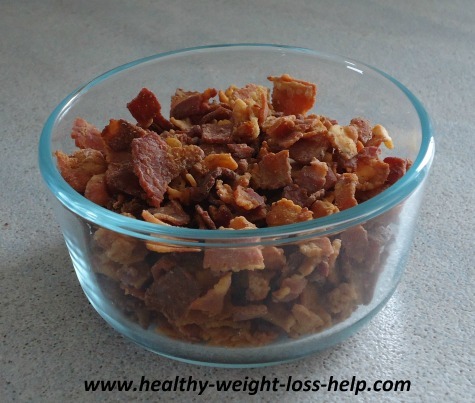 If you’re not worried about a few extra calories then also add some bacon bits and croutons to spruce it up. Want to know how many calories in the dressing? Well we did too, so we did a little research. This is why it’s considered a low calorie salad dressing. That’s a total of only 200 calories for 4 descent size servings which means that the calories for each serving are only 50 and that’s amazing. Using low calorie ranch dressing helps reduce the calorie intake greatly because once you add the garlic, lemon juice and parmesan it tastes just like Caesar dressing but with much fewer calories. Who knew such a simple trick can help cut back without sacrificing taste. If you would like to add a few bacon bits to this Caesar salad recipe, here is a great way to save time and money on the long run. I do love these crunchy little tidbits on my salad but that can be time consuming, so here is what I’ve been doing and it works great. I wait till there is an amazing sale on bacon and then I stock up. Two important pointers is first try choosing meatier bacon strips and avoid the fatty looking ones, and always check the due date on the package, though so far I’ve never had any problems. Once home I take 1 or 2 packages and cut them into smaller pieces, the size I like for my bacon bits (remember cooking shrinks them) and cook them up in a large frying pan. For me cooking the bacon till a little crispy works but whatever your preference drain the bacon bits well and then place on paper towels to really soak up the last bits of fat. Once completely cooled down I place them in a container and into the freezer. This way they are ready. You might need them for salads, perogies or perhaps that delicious baked potato, whatever the use it is a tasty garnish you can add literally in seconds. Also the additional packages of uncooked bacon can go right into the freezer till your ready to defrost and do the same thing. This is truly an amazing time saver that can be so useful on so many occasions. So enjoy more food with fewer calories.